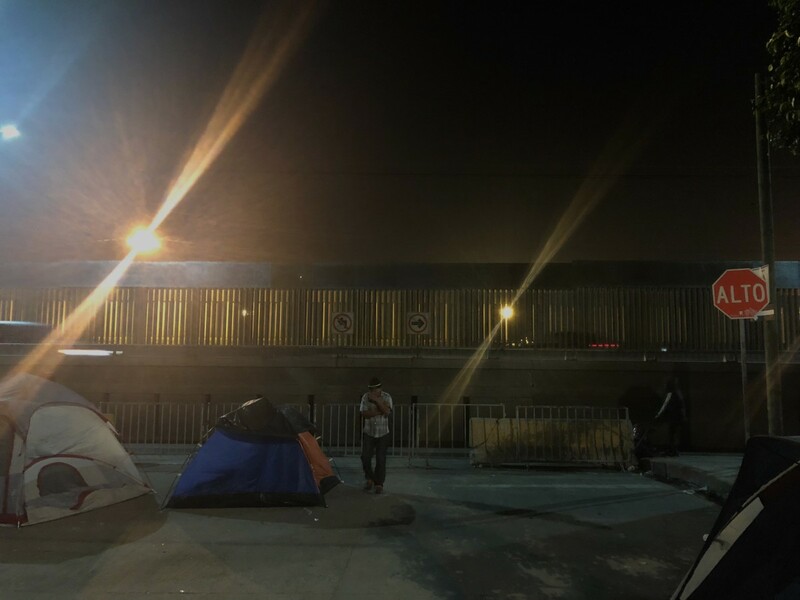 Even though the migrant shelter at Benito Juárez sports complex was closed and condemned as unsanitary, over 300 migrants remain camped on the street outside the complex. In the northern part of Tijuana, Mexico, in one of the city&apos;s more dangerous neighborhoods, a tent village of Central American migrants straddles the border wall with the United States. The makeshift village looks like a decomposed city block, as if apartment buildings have deteriorated into tents, which are pitched four or five rows deep on each side of the street. The sounds emanating through the 300-person camp are not unlike those in any neighborhood: parents singing to their kids, couples arguing about future plans, the clatter of plates during a meal. But these noises flowed out not from homes made of stone or wood or brick; they came from behind tarps. 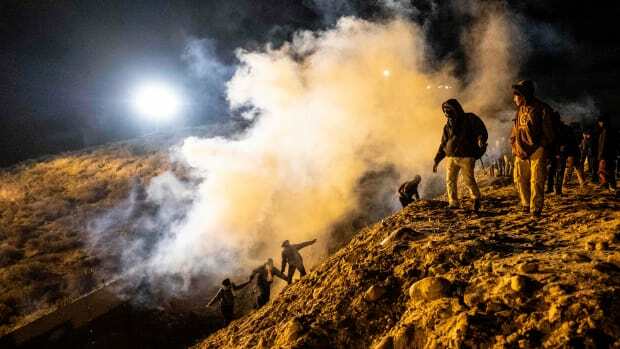 At the late hour, a steady steam of migrants walked up and down the street between the tents. Most of those up and about were young men, and many had an answer ready when asked, "Why are you here?" (There have been many reporters here over the last few weeks.) Some explained how gangs had threatened to murder them (or their families) back in their home country: Pepe, a Honduran man who had been working as an undercover police operative in a gang, displayed the bullet scars on his arm and leg. Another man, Guillermo, a father from Guatemala, explained that, back home, there was no work—they were starving. Try to understand, he implored, what it&apos;s like to be a father and watch your children grow gaunt. They had all joined one of the two caravans that had traveled from Central America north to the U.S. border. I had to clarify my question: I was asking what they were doing here, in the tent village, out in the elements. Back in the beginning of December, the Mexican government had opened a large indoor shelter in the southern part of the city. Why were over 300 migrants still living in tents, on the street outside the grassy field that had served as the original refuge? "This is where they put us," Guillermo says. "Now they want us to leave?" When the two Central American caravans first arrived in Tijuana in the middle of November, Mexican officials funneled some 5,000 migrants into a large sports complex next to the border wall with the U.S. The Benito Juárez complex, (named in honor of Mexico&apos;s first indigenous president), was an outdoor arena; when rains came at the end of the month, the camp flooded. 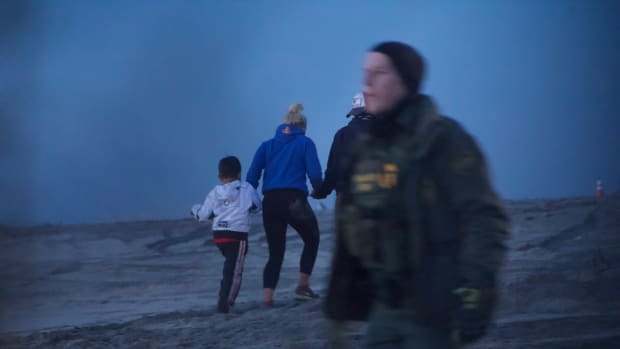 Tents sat in turgid pools of muddy water, and officials, citing intolerable health conditions, closed the Benito Juárez refuge. But many of the migrants staying in the Benito Juárez complex opted to remain. Forced off the field, they&apos;ve pitched tents along both sides of the street outside the complex. 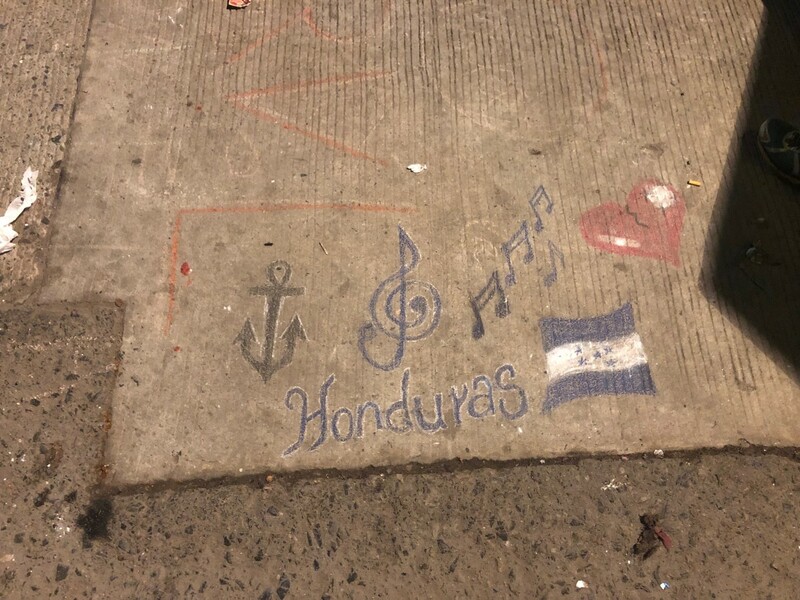 A piece of art created by migrants from the caravan on the sidewalk outside the tent camp. 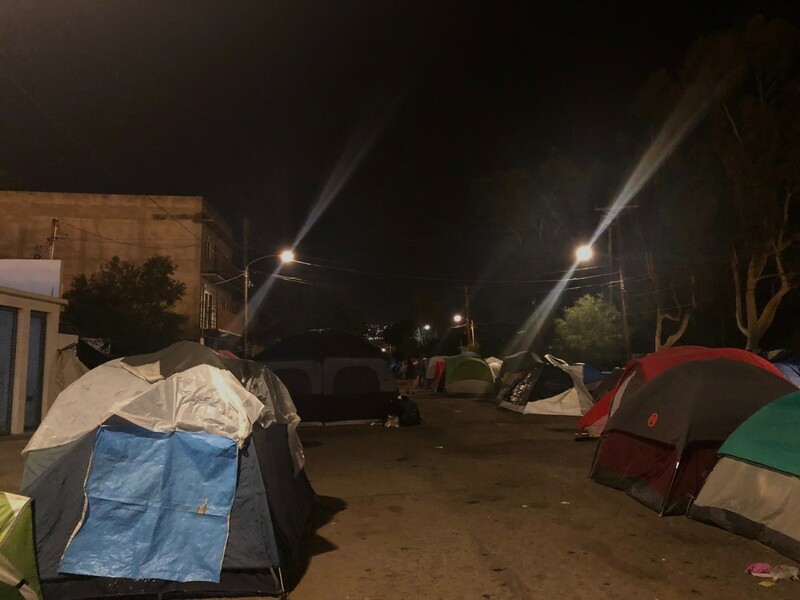 There&apos;s no one explanation as to why hundreds of migrants remain camped out in the elements here in Zona Norte, perhaps Tijuana&apos;s most notorious neighborhood. Many cite secondhand information that makes them distrust the new shelter: They&apos;ve heard that Mexican authorities will eventually storm the shelter to deport all its occupants. Others have heard conditions are not sufficient. "There are no bathrooms there," Juan, a 22-year-old from Honduras, says when asked why he has not left for the other shelter. "And they don&apos;t have room for more people." In December, the new shelter opened up in a vacant night club, called El Barretal, in the southern part of the city, about 10 miles from the border. There, all levels of the Mexican government have convened to provide migrants with food, shelter, and medical assistance. A state-run clinic offers dental services. The United National International Children&apos;s Emergency Fund maintains a "pavilion" within the shelter to serve migrant children. Despite what Juan says, El Barretal does indeed have functioning bathrooms. Of the original 5,000 migrants, a little over 2,000 remain together in the shelter. Multiple state officials say there is room for plenty more. But when a local journalist explains as much to Juan, he just shakes his head. "I don&apos;t think I&apos;ll go there," he says. Because the Mexican government has focused its resources on El Barretal, health services have closed down in the Benito Juárez area. The one-time medical clinic is gone. Food comes irregularly—occasionally church groups bring supplies, but some days many in the camp go without eating. And there is also no access to bathrooms; migrants say they&apos;ve been relieving themselves wherever they can find a suitable place outside. 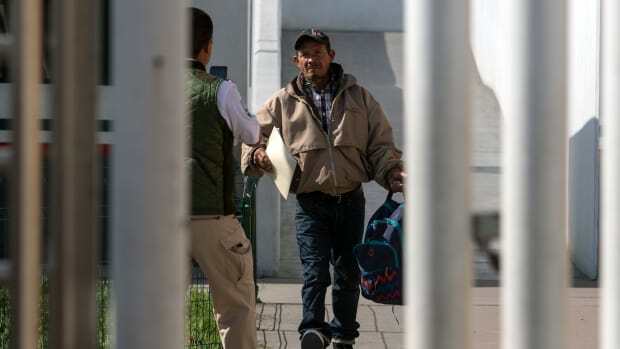 "All the migrants around Benito Juárez have been invited to El Barretal," says Oscar Ginera Aparicio, the state director of health services in Tijuana. "They continue to be welcome, and there are services available to them there. They have chosen not to come." 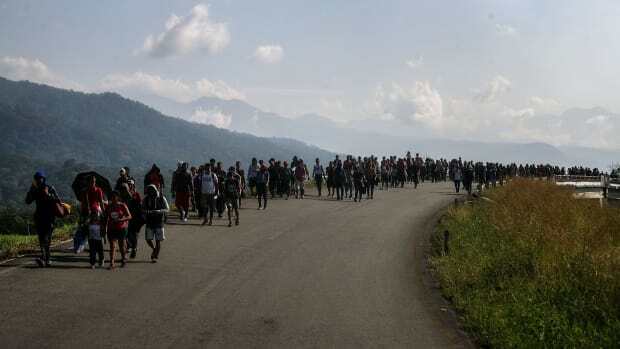 Ginera says the municipal, state, and national government are cooperating to provide sufficient migrant services in El Barretal. He says his agency will periodically review the camp at Benito Juárez, and intervene if there is a health crisis. On Thursday, some migrants in the Benito Juárez camp staged a small protest, where they demanded the government again provide bathrooms and health services to the camp. The tent village outside of the Benito Juárez sports complex in Tijuana, Mexico, straddles the border wall with the United States, visible in the background of this photo. Even though there are no bathrooms around the Benito Juárez complex, Guillermo also cites this supposed lack of restroom access when explaining why he won&apos;t go to El Barretal. When someone tells him there are bathrooms in the shelter, Guillermo, like Juan, is silent for a moment. "Then I don&apos;t have the money to pay for transport between El Barretal and the border," he says. Many people here believe the government moved the shelter 10 miles south in order to make crossing the border more difficult for larger groups of migrants. 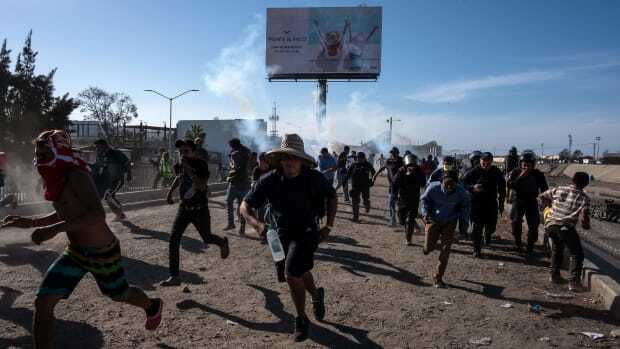 The timeline of events would seem to support this explanation: On November 25th, after U.S. Customs and Border Patrol Agents fired tear gas on a large group of migrants attempting to cross the border wall illegally, city officials in Tijuana faced pressure to avoid outbreaks of violence. The shelter move was announced soon after. But the Mexican government does provide transportation between El Barretal and the official port of entry into the U.S.—reached via a crossing called El Chaparral. Migrants living in El Barretal take government-provided buses to El Chaparral daily, where they wait in line to ask for asylum in the U.S. in the port. (Waiting one&apos;s turn can take months.) For the migrants still living outside of the Benito Juárez complex, the daily trip to El Chaparral is just a 15-minute walk along the border wall. Someone tells Guillermo that there are buses to take him from El Barretal to El Chaparral, but still he shakes his head. He looks down the street—at the far end of the tent camp is the border wall. Pepe, the man with bullet scars, says this is the reason he and many others stay camped out next to the Benito Juárez complex: the constant view of the border—the view of el otro lado (the other side). During months of walking north, this had been the constant destination. "The border wall is an image, it&apos;s a dream, an illusion," Pepe says. "I don&apos;t want to be in a shelter, somewhere inside, all closed off, where I can&apos;t see it. We have traveled so far. I&apos;m not letting the other side out of my sights." A defunct nightclub in the south of the city now hosts the thousands of migrants who arrived in the two caravans from Central America. Legal experts and migrants' rights advocates warn that the crisis will persist as migrants continue to arrive in Tijuana and other border towns.